Instead of viewing your photos one at a time, you can easily view multiple photos in Windows 8 by running them in a slide show. You can run the slide show from within the Photos app. The slide show displays each photo for a few seconds and then automatically moves on to the next photo. 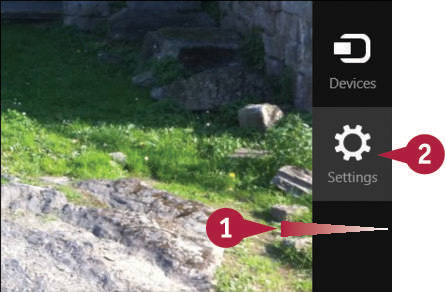 Alternatively, you can view a slide show of images using the Photos tile on the Start screen. This slide show uses random images from your Pictures library and other connected photo libraries, such as Facebook and Flickr photo sharing. In the Photos app, open the library that you want to use. Tap the album that contains the photos you want to display in your slide show. The Photos application bar appears. Tap Slide show (see the previous image). The Photos app begins the slide show. In the Photos app, swipe left from the right edge of the screen. The Photos Settings pane appears. Slide the Shuffle photos on the app tile button to On. The next time that you display the Start screen, the Photos tile displays a slide show of random images from your libraries. 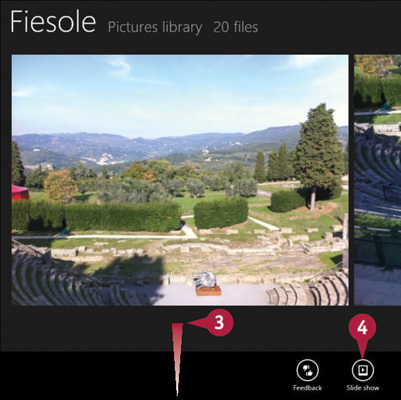 If you do not see the images on the Photos tile, make sure that the Photos tile is live. 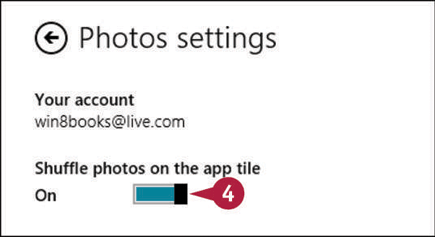 Swipe down on the Photos tile and then tap Turn live tile on. Unfortunately, the Photos app does not allow you to change the speed at which slide show images are displayed. However, you can adjust the speed if you start the slide show from File Explorer on the desktop. Tap the Desktop tile, tap the File Explorer button (), double-tap the Pictures library, and then double-tap the folder that you want to view. In the ribbon, tap the Manage tab and then tap Slide show to start the show. To control the speed, tap and hold the screen, release to display the shortcut menu, and then tap the speed that you want: Slow, Medium, or Fast.